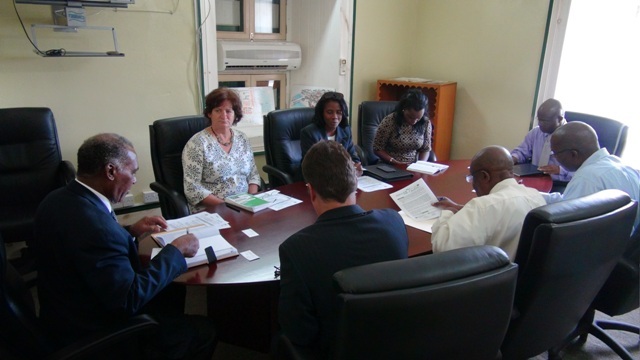 NIA CHARLESTOWN NEVIS (JUNE 16, 2015) — Environmental management of The Narrows and marine boundaries around St. Kitts and Nevis were on the agenda when a team from The Nature Conservancy met with Premier of Nevis Hon. 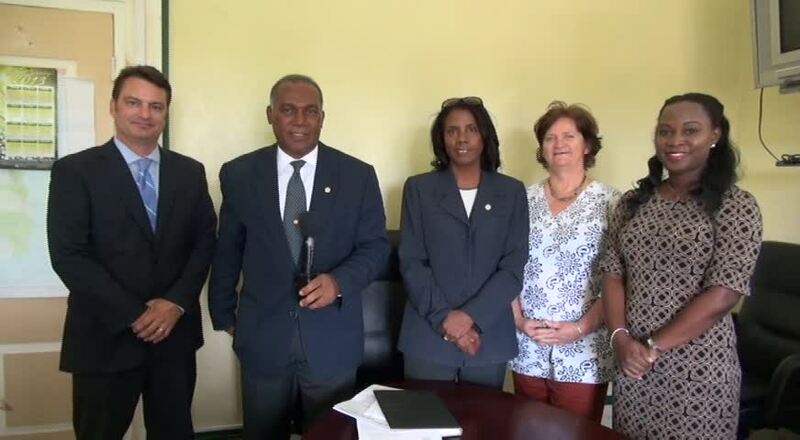 Vance Amory and relevant Permanent Secretaries in the Nevis Island Administration (NIA). The meeting took place at the NIA’s Cabinet Room office on June 11, 2015. Following the meeting Mr. Amory told the Department of Information he believed that the impact of the discussions held could have far-reaching consequences and importance because of the steps being taken to manage the marine resources, to ensure that there is long-term benefit through the management of those resources for fishing and other cultures in the marine environment and the benefits it could bring to the livelihood of the people of Nevis. He said the project which was led by Country Coordinator Mrs. Janice Hodge had begun an awareness campaign which would be intensified, to sensitise fishers and others in the community about protection of the marine environment. Mr. Amory used the opportunity to urge the people of St. Kitts and Nevis to take a serious look at the matter of climate change and its effects and to look at what the project would mean and to throw their support behind its implementation. Mrs. Hodge who gave greater insight into the project said it was one of two major projects being managed by the conservancy but overall it is looking at the management of the resources both marine and terrestrial and how best they could ensure that the marine resources could be sustainably used and managed so that all stakeholders could enjoy the benefits into future generations. She said the team has already embarked on the “This is who we are SKN” campaign to raise awareness about the value of The Narrows to St. Kitts and Nevis and has so far engaged in a number of activities. The Nature Conservancy’s Programme Director for the Eastern Caribbean Ruth Blyther, who is based in St. Croix was also present. She noted that the conservancy had been a partner with Nevis on a number of projects. Blyther explained that their focus is on working with the blue area of the island which is much larger than the land space and provides much to the people of St. Kitts and Nevis in their daily lives through tourism, food and its contribution to the island’s beauty. Therefore taking care of that resource is part of what the conservancy wants to do in St. Kitts and Nevis. Senior Director of Product Development Robert Weary said his focus was on helping to develop sustainable finance mechanisms that would be in place for perpetuity and help to fund the long-term management for protected areas and marine resources in general.